Here’s a tip for rounding out your summer reading. 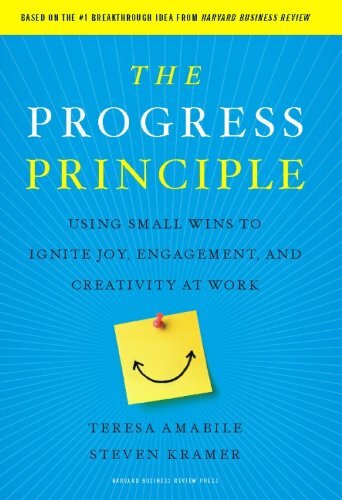 Pick up a copy of The Progress Principle: Using Small Wins to Ignite Joy, Engagement, and Creativity at Work. The book, which pubs today, is one of the best business books I’ve read in many years. (Buy it at Amazon, BN, or 8CR). The authors — Harvard B-school professor Teresa Amabile and developmental psychologist Steven Kramer (yep, they’re married) — explored the question of when people are motivated and engaged at work. And to do that, they took a rigorous and painstaking approach. They recruited 238 people across 7 companies — and each day sent these folks a questionnaire and diary form about their day. Twelve thousand diary entries later — you read that right: Amabile and Kramer amassed 12,000 days worth of data — they reached a set of fascinating conclusions. Chief among their findings: People’s “inner work lives” matter profoundly to their performance — and what motivates people the most day-to-day is making progress on meaningful work. I asked Amabile if she’d answer some questions for Pink Blog readers about her book and her insights. You can read the interview below. You can also talk to her live later this month on the next episode of Office Hours. Lots of business books talk about the need for bold, audacious goals — and deride those who “think small.” But your book, which is based on research far more rigorous than its counterparts, takes a different stance. 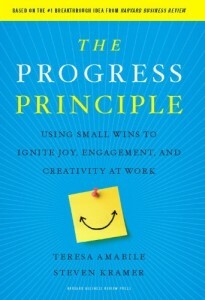 You emphasize the power “small wins.” Why are those so important in the performance of individuals and organizations? In addition to examining 12,000 daily diary entries from workers, you also surveyed a few hundred leaders — from CEOs to project managers — about what they think really motivates employees. What did you find out? Our survey showed that most leaders don’t understand the power of progress. When we asked nearly 700 managers from companies around the world to rank five employee motivators (incentives, recognition, clear goals, interpersonal support, and support for making progress in the work), progress came in at the very bottom. In fact, only 5% of these leaders ranked progress first – a much lower percent than if they had been choosing randomly! Don’t get me wrong; those other four motivators do drive people. But we found that they aren’t nearly as potent as making meaningful progress. Along those lines, many bosses believe that best way to ensure top performance is to keep their charges on edge — hungry and a little stressed-out. But you found something different. Explain. If people are on edge because they are challenged by a difficult, important problem, that’s fine – as long as they have what they need to solve that problem. But it’s a dangerous fallacy to say that people perform better when they’re stressed, over-extended, or unhappy. We found just the opposite. People are more likely to come up with a creative idea or solve a tricky problem on a day when they are in a better mood than usual. In fact, they are more likely to be creative the next day, too, regardless of that next day’s mood. There’s a kind of “creativity carry-over” effect from feeling good at work. Yet negative events have a more powerful impact than positive ones. Why? We were pretty shocked to discover the dominant effect of negative events on inner work life – people’s mostly-hidden emotions, perceptions, and motivations at work. Setbacks have a negative effect on inner work life that’s 2-3 times stronger than the positive effect of progress. When we checked into whether other researchers had found something similar, we learned that it’s a general psychological effect; “bad is stronger than good.” The reason could be evolutionary. Maybe we pay more attention to negatives, and are more affected by them, out of self-preservation. So – because positive inner work life is so important for top performance, leaders should do whatever they can to root out negative forces. I was especially intrigued by your findings about time pressure. Sometimes it helps; other times it hurts. Tell us what you found. The typical form of time pressure in organizations today is what we call “being on a treadmill” – running all day to keep up with many different (often unrelated) demands, but getting nowhere on your most important work. That’s an absolute killer for creativity. Generally, low-to-moderate time pressure is optimal for creativity. But we did find some instances in which people were terrifically creative under high time pressure. Almost invariably, it was quite different from being on a treadmill. Rather, people felt like they were “on a mission”— working hard to meet a truly urgent deadline on an important project, and protected from all other demands. What are one or two specific things individuals can do to improve their inner work lives and increase their chances of making progress on meaningful work? What are one or two things bosses can do to re-architect the workplace and its policies to put progress at the center? Bosses can religiously protect at least 5 minutes, every day, to think about the progress and setbacks of their team, and what enabled or inhibited that progress. The daily review should end with a plan to do one thing, the following day, that’s most likely to facilitate progress – even if that progress is only a small win. I think this practice, if used widely, could make a real difference in organizational performance and employee inner work life. And good inner work life isn’t only a matter of employee retention or the bottom line. It’s a matter of human dignity. So, how do we get upper management to buy in to this? It seems like there’s an unwritten rule that workers must be miserable to perform. So, we all run around (on the treadmill) not really getting anything accomplished yet we’re at each others throats. It’s such a paradigm shift in thinking, regardless of the overwhelming evidence, that it will take decades to change. Thanks for recommending the book, I ordered it up after the ‘Office Hours’ discussion you had with Bob Sutton. The book is very good. I was actually a little surprised the book didn’t include Mother Teresa’s quote “Be faithful in small things because it is in them that your strength lies.” (http://bit.ly/pf5l6c) I thought it would fit in quite perfectly, especially in these times. I understand that fear and pressure are over used and that positive motivators make for more pleasant discussions, but these are difficult times, and to pretend that there’s no pressure to preform or reason to be concerned misses an important reality. This is a difficult economy and prudent business policy dictates that one ought to plan on operating with lower revenues for a good amount of time. I agree with what you wrote in Drive about motivation and especially what “The Progress Principle” identifies as intrinsic motivation. However, one shouldn’t underestimate how little fear clarifies what people should be motivated to do and keeps them on track. I don’t know what it is, Dan, but you know how to motivate people to do something. I want to stop everything and read this book right now. It makes complete sense. I think the key will be finding ‘meaningful projects’ for each individual to get excited about. In a large corporation, there are so many things that need to be done to keep the machine going that aren’t necessarily exciting ‘change the world’ type efforts. We still have to process the TPS reports. But there are always things to do to make things better, so if people can get out of the rut of the things they ‘have to do’ and work on things they ‘want to do’, even if it’s just for 20 minutes a day like the authors recommend, then it’ll hold them over to get through the stuff that isn’t so fun. The small wins should be the ones we bring up more often. You don’t master something overnight, even if there is a ground breaking invention or theory it didn’t happen overnight but over a lifetime usually. I would hope that we recognize practice and chipping away more today because everyone can relate. You have better odds of attempting to start a few failed small businesses over a lifetime than you do winning the lottery. I’ve found that the most difficult thing to bring up is not the validity of data (as this book seems to offer), but instead the actual changes that are required in corporate culture in order to move meaningful change forward. I have approached multiple people at the (engineering) company I work at with the ideas you present in Drive, Dan. It’s always head nodding and agreement with the principles; but when I ask if there can be any action, it’s always “we can’t afford it”. I maintain that companies can’t afford not to do it. Thanks for the book rec, I clicked “Buy” on Amazon right after I read you saying it was the best business book you’ve read in years. That’s enough for me to check it out! I need thoughts and ideas about how to relate the ideas put forth in books like The Progress Principle to teachers work environments. Teachers can’t leave the building, and have basically no time during the day to think creatively. At the end of the day, by the time you plan for the next day, attend meetings etc. you are too exhausted to be creative. How can all the wonderful ideas in the business books (besides Drive which relates ideas to teaching)be modified for teachers? Brilliant. Can be applied to families and other units as well. Thanks for sharing. Managers cannot rely on old-school recognition practices of Years of Service, Employee of the Month, President’s Club and similar to achieve this. Such programs only recognize results (or, in the case of YoS – ability to not leave). Rather, employees must focus much more on progress along the way – celebrating the behaviors, achievements, etc., that end up delivering the major successes. In today’s world of projects that can last 2-5 years before final completion, celebrating progress critical. Hey Dan read and loved your books and I stumbled across a site you will love. I never can get my head around the idea that some companies think getting people stressed out is good management. Sure, there is the idea that they’ll be pushed to work hard and rise to the challenge. But what ultimately happens is that people get on edge, end up looking after only themselves and not the good of the team, and be so tense anticipating what will come next that they won’t be much good at what they’re supposed to be doing in their jobs. The principles behind this share some similarities with the concept of Rapid Results that is gaining momentum in the international development community. The idea there is to use small victories to make progress (and create a sense of enthusiasm and ownership in the process) without trying to do everything in one big project. “Not changing the system, but not being beaten by the system,” to paraphrase some of the developers. It’s always interesting to see the overlaps between the private and public sectors. As an engineer, I find that having an engineering problem is more energizing than not. However, it’s the little frustrations that go along with getting things done (whether, it’s “It costs too much.” or I can’t get a software release to build) that saps the energy out.